Geraldine J. (Gerri) Viant was one half of the winningest team ever in the history of women's platform tennis with eight Women's titles over a 13 year span. 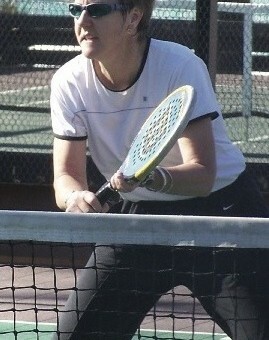 Between 1990 and 2002, Viant and partner Sue Aery, won eight Women’s Nationals and were finalists in 1991 and 1999. They then retired for a year or so to let everyone else practice before returning to reach their last final together in 2004. They were winners of the Women’s 40+ nationals in 1999, and Viant also won this event in 1998, and was a finalist in 1996-1997, 2002 and 2006. Gerri also won two Mixed Nationals (1989 and 2000) and was a finalist in 1988 and 1990. Born and raised in Adelaide, Australia, Viant’s introduction to paddle came on a whole other continent. She had been backpacking around the world when she stopped to see her childhood tennis coach, who at the time was teaching in New York City. She started helping him and, in turn, he introduced her to paddle. Gerri was immediately hooked. She loved everything about it, running the balls down off the screen, volleys, the strategy and the teamwork that it required. During the fall, just before she was due to go back to Australia, she interviewed for the head tennis professional position at The Nyack Field Club. While there for the interview, she noticed they had two paddle courts. When offered the tennis position, she asked about paddle and it turned out the club didn’t have a program or a professional. Since tennis season was some time away, Viant suggested she start right away with paddle and get to know the membership before the next tennis season began. The club agreed and, so, even though Gerri had never taught paddle, barely played the game herself, and had never seen it played at a high level, she went to work building up the programs at the club. 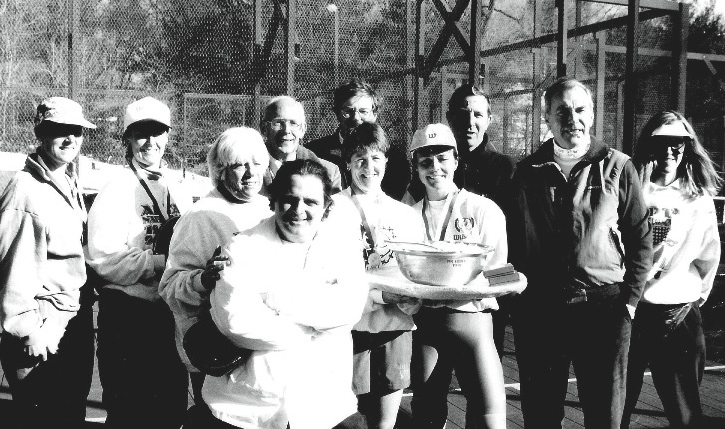 She is still the paddle and tennis pro at the Nyack Field Club, running a highly successful year round program for members, and acting as the club’s manager. Viant never returned to live in Australia, but was there on vacation when she learned that she would be inducted into the Hall of Fame. It was a rather ironic moment because, 24 years earlier, paddle had played such a huge part in her decision to stay in the USA. Gerri has said that she was lucky enough to be learning the game at the same time as one of the greatest female athletes to have ever played paddle—Sue Aery. She remembers watching Aery play and being amazed at her footwork. Sometimes she would even throw up a short lob just to watch how her footwork would get her out of trouble. What made this team so successful? Was it their motivational song, “When we were Kings?” Maybe it was because they ate the same meals during tournaments? Maybe it was the specific placement of their water bottles and tissue boxes on the court that brought good luck? Maybe it was their Wilson paddles? It was really a combination of their individual talents and great team chemistry, despite the fact that they had contrasting on- and off-court personalities. Aery wore her heart on her sleeve, and was at her best when in full flight, while Viant played her cards a little closer to the vest, and was more in her element with the strategy and concentration that the game required. They worked well because they were best friends, win or lose. Proper positioning and consistency were the benchmarks of their success. They both had amazing racket skills and the uncanny ability to make unbelievable shots at unbelievable times. They played a game that looked effortless; Gerri sliced and diced the opposition until Sue got the opportunity to deliver the knock-out blow. They covered the court like no other team, with Gerri rarely missing any shot and Sue running around the court to make one of a kind gets. However, their real talent as a team, and what set them apart from the competition, was the disciplined approach they took to playing matches. Long before they ever got on the court, they would be studying tapes of matches, eating the right foods, working out in the gym and drilling and practicing. They prepared constantly throughout the course of a season for the Nationals, and when it rolled around in March, they were ready to excel. Gerri was the de facto leader on the court, a role that came by her naturally On her fourth grade report card at the Cabra School in Adelaide, her teacher wrote: “Gerri is a natural born leader but is leading other children in the wrong direction.” Evidently, before she knew anything about physical fitness, Gerri smoked cigarettes. This resulted in many trips to the principal’s office in an effort to get her on the right track. It worked. In 1997, Viant and Aery founded Performance Paddle Camps, which pioneered the idea of a traveling camp for platform tennis. The following year, they were joined by Mike Gillespie. The camps helped to grow the game by offering high-level instruction in areas of the country where there were no paddle pros, and by instructing tennis pros in these areas how to teach and promote the game of platform tennis. This collaboration, along with some fellow teaching professionals, led to the formulation of a body of instructional knowledge. Eventually, this core group became the founding Board members of the Professional Platform Tennis Association (PPTA).